In the remote waters of Larsen Bay, off the coast of Kodiak Island, an experiment is underway. Two types of kelp are strung on lines in the ocean waters, and researchers, investors and commercial fishermen are all watching to see if they grow. Erik O'Brien, a commercial fisherman, planted the kelp last month. He's one of three Alaska kelp farmers working with a California-based company that's investing in the project. 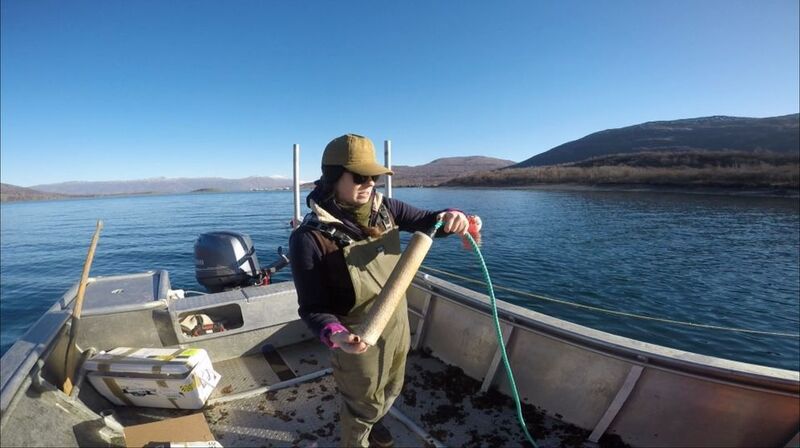 The experiment could represent the start of a fledgling kelp farm industry in Alaska. But O'Brien isn't sure yet whether the venture will pan out. "There's way more questions than answers," O'Brien said. In late October, O'Brien headed out to Larsen Bay. After six months of working through the state process, he had received his permit and planted sugar kelp and ribbon kelp on 4,600 feet of line. In a few days, after some equipment malfunctions, O'Brien and his team got the lines in the water. It was slow going — much slower than anticipated, he said. A few weeks later, a storm blew through the bay. He's pretty sure the kelp survived. He's been told the buoys are still floating. Now, he'll wait to see if it all pays off. He's hoping for 25,000 pounds flourishing on the lines by spring. Globally, seaweed production is booming. Commercial seaweed markets were valued at $10 billion in 2015, and are projected to more than double by 2024, according to a Grand View Research report released in April. As a food, seaweed is touted for its health benefits. It has a range of other applications as well — including, potentially, in the global carbon trading markets. Alaskans are looking to get in on the action. And investors think sugar kelp may be the key. 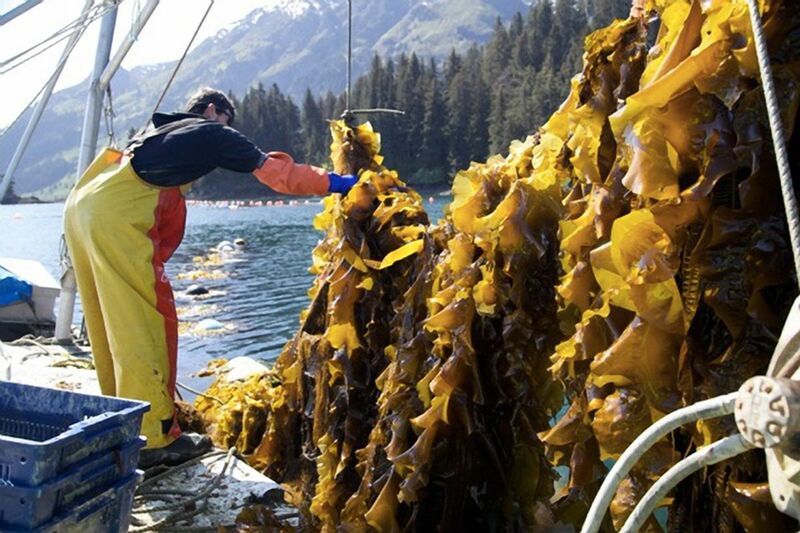 Kelp farming in Alaska is getting a big funding boost. 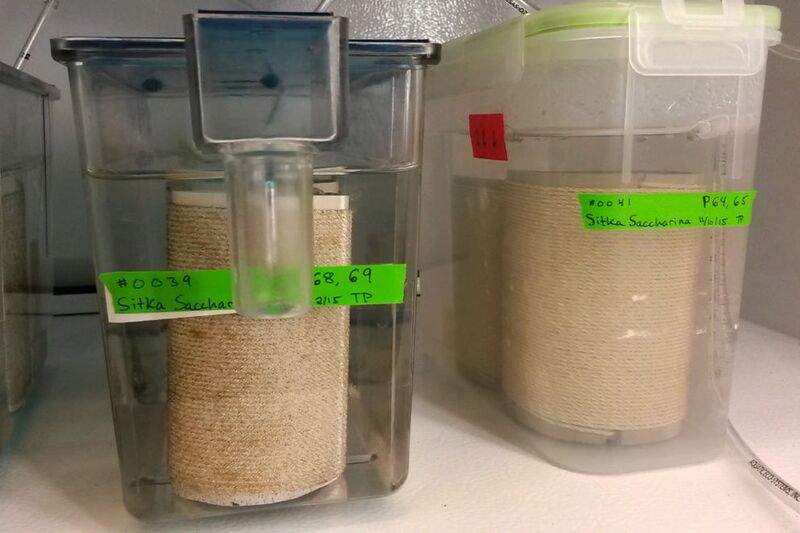 Alaska Sea Grant, part of the University of Alaska Fairbanks' College of Fisheries and Ocean Sciences, is investing $418,000 in seaweed hatchery research, according to director Paula Cullenberg. Part of that funding is federal and part is from a San Francisco-based company Blue Evolution. Blue Evolution, formerly known as Premium Oceanic, has been investing in seaweed production in Mexico for three years, and has now turned its eye to Alaska. "I've always been intrigued with Alaska as a frontier of business," Blue Evolution owner Beau Perry said. Alaska's cold waters are ideal for sugar kelp production, with over 6,000 miles of coastline, more than the rest of the U.S. combined. And it doesn't suffer from some of the pollution issues as other parts of the U.S., Perry said. The market for kelp exists in the U.S. and abroad, especially Asian countries, Perry said. Sugar kelp (Saccharina latissima, a type of Kombu) has an "umami" flavor — a fifth flavor profile in the human palette, defined as meaty and savory. Kelp's glutamic acid (a type of amino acid) is the basis of flavor enhancer monosodium glutamate, or MSG. Like other seaweeds, kelp offers nutritional benefits. "People are into that now with food," Perry said. Blue Evolution's new website sells seaweed pasta and seaweed seasonings, marketed as a "superfood seaweed." It could potentially be used as a biofuel, Perry said, or in pharmaceuticals and cosmetics. There's also potential profit in kelp as a carbon offset. Kelp removes carbon dioxide — a contributor to climate change — from the ocean. Carbon offsets work when one company that creates carbon emissions buys into another that removes carbon from the atmosphere. As Perry put it: "They cut me a check if I weigh the seaweed and have a good formula for how much carbon is embedded in it." There's no federal mandate for buying carbon offsets in the U.S. But the global carbon trading market was $53 billion in 2015, according to Carbon Pulse. 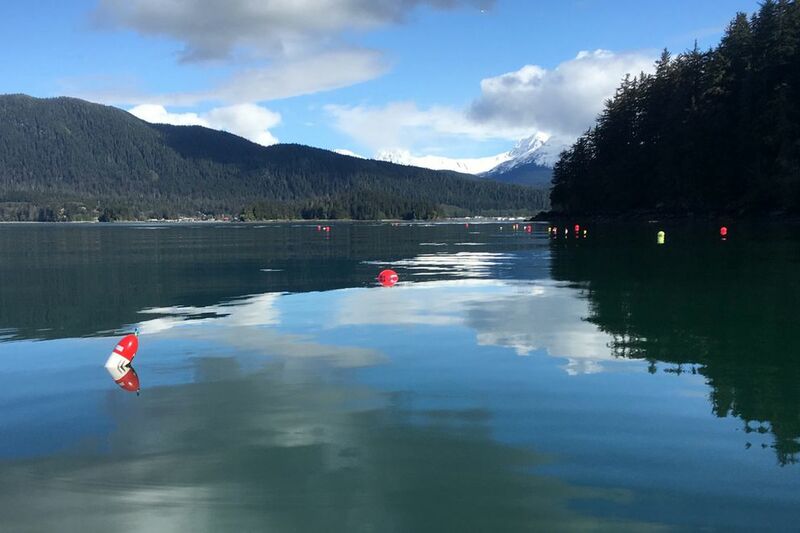 Meanwhile, Alaska's first two seaweed hatcheries just received their permits last year, according to Michelle Morris, commercial fisheries permit coordinator with the Alaska Department of Fish and Game. Michael Stekoll, a professor of chemistry and biochemistry at the University of Alaska Southeast, is a researcher at one of those hatcheries. The Alaska Sea Grant money will fund Stekoll's two-year project to study the best way to grow sugar kelp. Stekoll's hatchery — what he called a "nursery" — seeds the kelp over the course of two months. Kelp spores grow on PVC pipe wrapped with string. That string is then transferred to kelp farmers like O'Brien. Right now, costs are a big question mark. "The issue right now is providing the seeded string to them in a way that's economical feasible," Stekoll said. To bypass farming, you could get a permit and harvest wild kelp to sell, according to Morris. But given the time and energy involved, it wouldn't make much sense, O'Brien said. "And of course, that impacts the wild resource," and other users, like subsistence harvesters, Morris said. Kelp harvest isn't legal in all areas. "Southcentral was severely overharvested several years ago, so it's all closed," Morris said. Kelp farms keep increasing. Six existing aquatic farms (growing products like oysters) have added kelp to their species list this year, according to Morris. And O'Brien's brother-in-law, Nick Mangini, was granted a new permit for a kelp farm in late October, also on Kodiak Island. Should all go well this winter, O'Brien's kelp will be harvested in the spring. O'Brien hopes to harvest 17,000 pounds of sugar kelp, and 8,000 pounds of ribbon kelp every year, but he gave those estimates "with a great deal of uncertainty," he wrote in an email. Blue Evolution will process the kelp in Ketchikan using a propriety unit that flash dries the plant and grinds it into powder. And since Ketchikan's power is from a hydro-electric plant, that adds to the company's environmentally friendly branding. The company plans to ship several dry tons of kelp to Seattle next spring, using commercial fishing vessels during their off season, Perry said. From there the powder can be shipped to manufacturers and added to retail products. It's got a long shelf life, so that makes the powdered kelp easier to work with than many other kinds of seafood, which spoil quickly. "Alaska seafood products enjoy a tremendous advantage in terms of their perceived quality," Perry said. But doing business in Alaska is expensive. Perry believes the farms will need to be larger, increasing their revenue, to be able to compete on an international scale. With the booming production, there are signs of industry-wide problems. Rapid expansion globally could lead to unintended consequences, both ecologically and socially, a United Nations branch warned earlier this year. In Maine, an annual seaweed festival took a year off this summer due to sustainability concerns, as a "gold rush mentality" has swept the state's industry, the organizer said. In Alaska, the state is being cautious about how kelp is being propagated. It must be picked wild from within 50 kilometers of the farm site before being sent to the hatchery, which grows kelp spores on twine. At least 50 distinct parent plants must be chosen for the hatchery to work with. "We support that principle, but there are some clear ways that maybe we could expand that," Perry said of the constraint. "They're trying to keep the natural populations from being overrun," UAS scientist Stekoll said of the requirement. Kelp genetics aren't well understood, he said. That makes kelp farming more expensive, but may also protect Alaska's waters. "In order to protect local species and ecosystems in the absence of enough information, this guideline was included in this permit," Fish and Game's Morris wrote. "However, as more data and information becomes available (there is a current genetic study going on), this stipulation may be relaxed in the future." For O'Brien, it's now a waiting game to see how the kelp fares during the winter months. "If we can get it right, I really think there's an opportunity," O'Brien said.